As reported in a December Southern Investigative Reporting Foundation story, Insys’ prior authorization unit (also known internally as the insurance reimbursement center) employees were trained and rewarded for saying anything, including purportedly inventing patient diagnoses, to get Subsys approved. The revelations illuminated the answer to the conundrum raised in our previous stories: how does a company marketing a standard Fentanyl spray formulation, under a strict FDA usage protocol, easily double the insurance approval rates of its more established competitors? Internal Insys documents and an audio recording of a PA unit meeting show that as recently as the late autumn executives were frantically brainstorming new ways to get around increasingly stringent pharmacy benefit manager rule enforcement. “[PBMs] had begun to deny Insys’ [PA] requests in the early autumn to the point where it was rare to get more than two dozen approvals per week for the unit,” said ex-PA staffer Jana Montgomery (a pseudonym) and something that began to accelerate after the CNBC reports came out. Unlike their sales unit colleagues, Insys PA staffers can’t call on long standing professional relationships with prescribers or use speaker’s program cash to win business. They are hourly workers–albeit among the higher paid prior authorization staff in the medical industry–dealing with other hourly workers and both have little latitude to depart from established scripts. If the PBM denies the coverage, Insys has few levers to pull, apart from beginning an appeals process. As critical reports began to pile up in the press, particularly a November CNBC investigative series–and with at least a half-dozen state and two concurrent federal investigations ongoing–insurers began to deny authorization for Subsys. Put bluntly, with state and federal subpoenas becoming a common occurrence, the PA unit could no longer afford to push the legal limits of word games. On the other hand, simply reporting an off-label diagnosis was an unpalatable option given that under 3% of Insys’ patients had cancer. So Jeff Kobos, the prior authorization unit’s new supervisor, wrote a new version of the spiel that was alternately called “Statement 13” or, in a homage to its confidential nature, “Agent 14.” It tried to thread a needle, designed to navigate both elevated PBM scrutiny and the rising level of compliance oversight required, while still allowing the unit’s employees to try and guide PBMs to an approval. The problem being, according to Montgomery, is that the PA unit had gotten behind the curve. 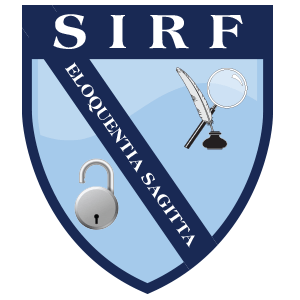 The Southern Investigative Reporting Foundation obtained a recording of this meeting, held in November. The initial speaker (and the clearest voice) is PA executive Jeff Kobos who makes a pair of important admissions: at the 2:20 mark he acknowledged the unit’s pattern of dishonesty by saying “when we were using [insurance codes for cancer-related pain diagnoses] for non-cancer [pain].” At 4:30, he made jokes referring to “sandwiches” and “the sky is blue” as the kind of conversational gambits they should try and deflect PBM worker questions with. At 5:00, David Richardson a trainer with the PA unit, suggests dropping the “Agent 14” spiel since it wasn’t working. A minute later, he and his wife, Tamara Kalmykova, an analyst with the PA unit, begin to discuss an idea he had in response to so-called smart-scripting, whereby PBMs use software analysis to determine if a patient–per the FDAs protocol–had tried another Fentanyl drug. Richardson suggested patients use a coupon for a free-trial prescription of Cephalon’s Actiq. The patient wouldn’t pick the drug up but it would register in databases and allow PA staffers to plausibly claim that the patient was in full compliance with regulations. But smart-scripting wasn’t the only new obstacle that unit staffers were encountering. Humana, Silverscripts Medicare and other PBMs started requiring not only Actiq or Depomed’s Lazanda, a nasal spray, but the previous use of other major painkillers like Morphine/Morphone, Oxycodone and Hydromorphone. Still others were calling prescriber offices and confirming every aspect of the diagnosis, including prior history with Fentanyl and other opioids. Unfortunately for Insys’ shareholders, the hard line taken with its prior authorization unit is having a very real effect on prescription count, according to IMS Health data. 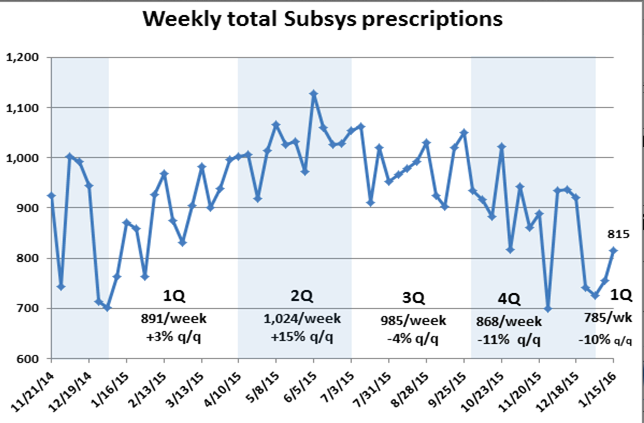 The number of Subsys prescriptions filled in the third quarter dropped about 4% from second quarter levels and the erosion accelerated in the fourth quarter, falling an additional 11%. Thus far in January, the new year hasn’t brought much in the way of promise, with the 815 prescriptions reported for the week ended January 15 down 6% from the comparable week a year ago. Subsys’ share of the transmucosal immediate release Fentanyl market, which hovered near 50% for most of the summer, has now fallen below 45%. Jana Montgomery was given a pseudonym because of her cooperation with an ongoing federal investigation. Her account of PA unit practices was read to two of her former co-workers who agreed with her characterization of “the spiel” and declining PBM authorizations. Like prior Southern Investigative Reporting Foundation investigations, everyone named in the story was called repeatedly on mobile or home phones and left detailed messages about what we sought comment for. When possible an email was sent as well. As of publication, no one replied. Finally, a detailed message was left on Insys general counsel Franc Del Fosse’s mobile phone seeking comment on these subjects. As of press time it had not been returned.